One thing I rarely go a day without doing, is taking a screenshot. It’s not something you’d immediately associate as a developer tool, but I use it constantly. How many times have you gone back and forth with a client trying to describe an issue, when all could be resolved with a simple screenshot? 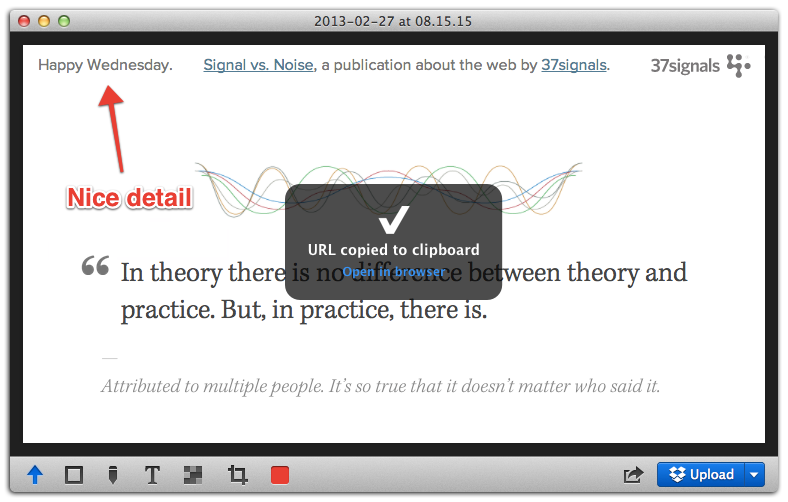 OS X has screenshot capabilities built right in, but I find the easy annotation features well worth the price. Explaining UI issues is much easier to do with annotations than just trying to describe what’s happening. Along with the annotations, you can hold down the option key to drag the image into any app that support drag and drop uploads, or click to upload directly to Dropbox and share publicly. I used to use a free app called Skitch. They were bought by Evernote and then once Skitch was integrated with Evernote it became unusably slow and clunky. Then Glui came along and brought back all of the best parts of Skitch and none of the crap. The app costs $6.99, but is well worth the price for something I use constantly.